"It was an amazingly transformative experience. I'll never forget it. Three million people, from every inch of the globe, all getting along together in a world where there's a lot of turbulence", said US Congressman Keith Ellison said of his recent experience of pilgrimage to Mecca, Saudi Arabia. This year, Rep. Ellison, Democratic Congressman from Minneapolis, became the first member of the US Congress to perform Hajj, according to Minneapolis Star Tribune. 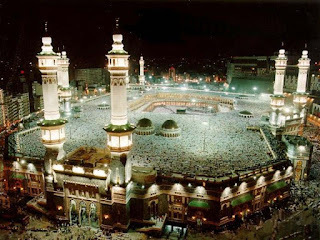 The Hajj consists of a series of rituals that honor an ancient pilgrimage and sacrifice of his favorite son (Muslims believe it was Ismael while Jews and Christians believe Isaac) offered by Abraham, a highly revered figure in Islam, Judaism and Christianity. In some ways, the Muslim beliefs are much more aligned with the Christian faith than the Jewish belief system. Although the Christians draw a lot from the Old Testament (Hebrew Bible), the Jews do not believe in Jesus as bringing guidance from God. In Islam, however, the belief in Jesus as a messenger of Allah is required as an essential part of the Islamic faith. Anyone who rejects Jesus is not considered a Muslim. The key difference between Muslims and Christians is that Muslim do not believe in Jesus as God or Son of God. Muslims believe in the Virgin Mary as the mother of Jesus and Jesus as a human being sent forth by Allah as a prophet to guide all of humanity. According to the Star Tribune, Ellison said he met a wide array of people, from the vice president of Bosnia and a former Saudi deputy oil minister to humble street cleaners. But on Hajj, everyone is treated the same. "Everyone's just a pilgrim, a Hajji," he told the Tribune. "You can't look at someone's shoes and tell what economic station in life they're at, because everyone's wearing sandals." Decades ago, another famous Muslim American leader, Malcom X aka Malik Shabazz, captured his Hajj experience in the following words, "There were tens of thousands of pilgrims, from all over the world. They were of all colors, from blue-eyed blondes to black-skinned Africans. But we were all participating in the same ritual, displaying a spirit of unity and brotherhood that my experiences in America had led me to believe never could exist between the white and the non-white." As expected, Ellison's visit has attracted negative attention along with positive coverage. Ellison has been criticized for missing the House vote on the auto bailout for his native Detroit. His spokesman has said Ellison hadn't expected the lame-duck session and noted that he'd earlier told House leaders of his plans. Some anti-Muslim bloggers have seized the opportunity to heap their hateful criticism on Ellison. A right-wing blog has accused that the Muslim Congressman's Hajj was funded by "Muslim Brotherhood terrorists". Another similar blog criticized Ellison for listening to a speech by a Saudi cleric at the Hajj urging Muslims to renounce capitalism, which in the blogger's view means the implementation of Shariah law. 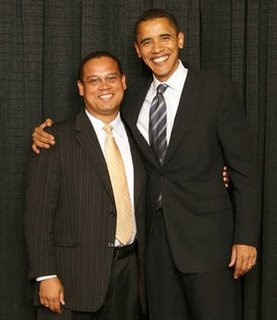 Ellison has also been the target of criticism by the far right for urging qualified American Muslims to apply for some of the 8,000 jobs he said are available now in the incoming Obama administration. Ellison has said that today - with a new U.S. president sporting "Hussein" as his middle name - there is no excuse for shying away from work because of an accent or a foreign name. Orthodox Muslim groups have not been particularly kind to Ellison for his "self promotion" and support of gay and lesbian causes. He has come under strong criticism for being "Proud to be Named Vice-Chair of Bipartisan Congressional LGBT Equality Caucus." The mission of the Caucus is to promote lesbian, gay, bisexual, and transgender (LGBT) equality. It's clear that Mr. Ellison's actions have not pleased his detractors among both Muslim and anti-Muslim groups. Good one Riaz. Many of my Indian Hindu and other friends asked me to pray for them as soon as they came to know that I am leaving for Hajj. I was impressed by their respect for all Islamic worship. Almost all of them mentioned Hajj as Hajj to be a fascinating event and one of my white colleagues mentioned that he would love to join as a tourist if permissible (I wish I could take him along..hopefully someday). Despite being a Muslim by birth I too find Hajj to be quite an extraordinary experience. I have also watched Malcom X's videos (now available on YouTube) and strongly recommend them for everyone. Sooner or later the generous US/western nations would find Islam to be quite a non-clashing civilization. Before we get too excited about this, it is good to know a little bit about some of the winners. For example the very first one, Keith Ellison, is "Proud to be Named Vice-Chair of Bipartisan Congressional LGBT Equality Caucus." The mission of the Caucus is to promote lesbian, gay, bisexual, and transgender (LGBT) equality. Are we proud of him? No comments on Gaza from President Hussain? What a shame. No blogs from you either!!!! ^[b]People are being invited to define themselves increasingly narrowly.They're either Muslim, or Christian, or British, American, or whatever. I became particularly aware of this with The Satanic Verses, when all these people who had previously not defined themselves as Muslims suddenly chose that identity in order to take up a certain position.The big problem with this attitude is that the more narrowly people define themselves, the more they diminish themselves as human beings – and the more likely they are to come into conflict with other people with equally narrow identities. The truth, of course, is that we're not just one thing, or another; we're all these little clouds of contradictions. And if you can accept that, then not only are you being truthful about yourself, but you're also likely to find you have things in common with other people. Also, that gives you a way of constructing a society that on the whole works. For anonymous who quoted Salman Rushdie ...so you stir up controversies, make those biased movies, make those insulting cartoons (actually insulting their own intelligence) is all a fair game and a good way of checking who defines himself more narrowly Riaz, how do you manage to attract such a variety of dumb and hateful people like Jaydev? Obama won Virginia by a little over 100k. The estimated Muslim population is greater than 250,000...Numbers in Florida and Ohio are similar.